Throughout his Proverbs, King Solomon advises those seeking to live a Godly life to steer clear of the wicked, and to avoid those who lie and defraud. “Be not delighted in the paths of the wicked, neither let the way of evil men please thee,” he tells us in Proverbs 4:14. One well-documented “way of the wicked” is the ongoing misbehavior of the country’s biggest lenders, who have repeatedly been implicated in a trail of fraud and manipulation since the housing collapse of 2008. 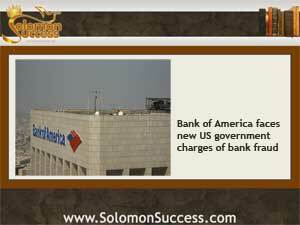 Witness the latest pair of lawsuits, filed just this week against perennial malefactor Bank of America. These new legal actions were initiated by the Justice Department and the US Securities an Exchange Commission in separate actions, accusing Bof A of fraud involving $850 million of mortgage-backed securities dating back to the start of the collapse. According to a new Reuters report, the twin lawsuits claim that Bank of America made “misleading” statements and concealed significant information about the mortgages, all of which were connected to a single securitization. A number of these mortgages were considered subprime and failed to meet mortgage underwriting standards, the suits claim. These charges are only the latest in a long string of legal actions that have caught Bank of America with its figurative fingers in the figurative cookie jar. The bank, along with a number of other leading lenders including Citibank and Wells Fargo, agreed in 2010 to a massive settlement relating to the “robosigning” scandal that pushed forward numerous fraudulent foreclosures. After that, several civil suits were filed accusing BofA of manipulating LIBOR rates to their advantage in international markets. The current suits, like their predecessors, make a clear connection – once again – between major mortgage lenders and the housing collapse, when mortgage holders all over the country, faced with ballooning mortgage payments they didn’t understand and couldn’t pay, fell into foreclosure. Back then, lenders such as BofA generated mortgages with wild abandon, selling loans to underprepared homeowners who failed the bank’s own lending standards. For its part, Bank of America claims that the mortgages in question were not misrepresented; they were sold to savvy buyers who understood all the ramifications of the loan, and that it’s all a big misunderstanding. But those statements, which also stoutly assert that BofA bears no responsibility for the housing crash, aren’t stopping the string of lawsuits.